A reader asked what I was wearing at the dinner of Parisian Gentlemen last week. Fortunately, a profile photo was taken that day at the intellectual property conference I was speaking at – the reason I was in Paris in the first place. In the picture, above: Cifonelli double-breasted cashmere jacket (SherryKash bunch); D’Avino spread-collar shirt; Drake’s navy grenadine tie; Francois Pinton glasses; and Kiton linen pocket square. Out of shot: charcoal worsted trousers (from Caliendo) and Cleverley chocolate Oxfords. It is a subtle combination of small surprises: cashmere herringbone rather than worsted, double-breasted rather than single, paler glasses than one might expect, and grenadine rather than plainer silk. Talking to Alfredo at Arnys that evening, he insisted it was “le style anglais”. Interesting, for I always think of it as an Italian look – hence the Italian Background. Then again, most sartorial traditions are other nations’ takes on the English look. England via Milan, perhaps. You can follow the discussion on Cifonelli jacket, D’Avino shirt and others by entering your email address in the box below. You will then receive an email every time a new comment is added. These will also contain a link to a page where you can stop the alerts, and remove all of your related data from the site. Commend the mix of fabric here but your choice of a DB in this instance is peculiar. The shape lends itself well to the regal builds of Charles and Michael but I think the Solito cut, would render the ensemble a sartorial triumph. However, each to their own. I love the outfit! It’s rare to see a double-breasted odd jacket, but this one works so well. What kind of weave are your worsted trousers in? Serge, gabardine, tropical or something else? Well, charcoal gabardine would explain the blue shirt. What a fantastic combination for what might have been a difficult jacket. Nice! Hi Simon, I notice that you seem to favour the cut away shirt collar lately. How do you feel this benefits the overall look of a suit? May I wish you, your family & all P.S readers a happy christmas. Nice shirt. 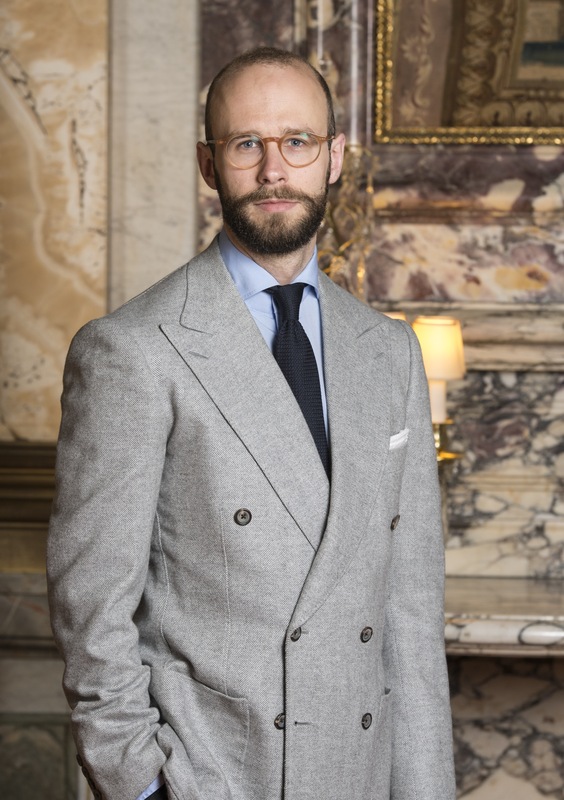 Simon, while charcoal trousers are probably the best pairing with a lite gray jacket they’re a non-traditional choice with others. I can’t think of any other odd jacket that wouldn’t be better with lite or mid gray providing the necessary contrast. Would you agree charcoal’s got limited application? (Mind you, I’ve seen pics of L Barbera in charcoals with lite jackets ). I believe that’s two jackets and one suit commissioned thus far at Cifonelli. What’s next with the brothers? Are you trying to catch up with Ralph Lauren’s order? I have a navy grenadine tie from Drakes, but I can never achieve such a tumescent knot – neither with four-in-hand nor kelvin. I believe Drakes sells versions of this tie in slightly different sizes – which is yours?